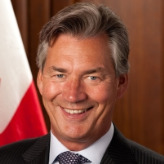 A longtime politician and former labor leader, Gary Albert Doer assumed his responsibilities as Canada’s ambassador to the United States on October 19, 2009. Born March 31, 1948, in Winnipeg, Manitoba, Doer attended St. Paul’s High School. He studied political science and sociology at the University of Manitoba for one year, and then dropped out to become a corrections officer at the Vaughan Street Detention Centre. He later rose to become deputy superintendent of the Manitoba Youth Centre. Doer became involved in organized labor and politics in the 1970s, when he joined the New Democratic Party (NDP). He discontinued his membership in 1975 to preserve the neutrality of his union, and was later courted by both the New Democrats and Progressive Conservatives to run for public office. He led the Manitoba Government Employees’ Association as president from 1979-1986. He also held prominent positions with the Manitoba Federation of Labour and the National Union of Provincial Government Employees, served as a director of the community-owned Winnipeg Blue Bombers football team, and became a governor of the University of Manitoba. He rejoined the NDP in 1986, and was elected to the Legislative Assembly of Manitoba for the northeast Winnipeg division of Concordia. He joined the government of Premier Howard Pawley in April 1986 as minister of urban affairs, and was given additional responsibilities as minister responsible for the Manitoba Telephone System. In February 1987, Doer was made minister of crown investments and was later named as minister responsible for the Accountability of Crown Corporations and minister responsible for the Liquor Control Act. He became head of the Manitoba NDP in 1988, at a time when the party had low popularity. He served as leader of the opposition during most of the 1990s, but gradually helped rebuild his party’s reputation. In the 1999 elections, the NDP was swept back into power, and Doer became premier of Manitoba. For the next 10 years, until he resigned to became ambassador to the U.S., he worked with American governors to enhance Canada-U.S. cooperation on trade, agriculture, water protection, climate change and renewable energy. His cultural interests range from the theater to professional football, supporting both the Minnesota Vikings and the Chicago Bears. He and his wife, Ginny Devine, have two daughters.